Substrate: Pasteurized straw, wood chips, sawdust, various grains, coffee grounds, agricultural waste, newspaper and cardboard. This is the common temperate Oyster mushroom. Depending on substrate, light and temperature, Pearl oysters will vary in coloration from white to gray and brown. Generally, more intense light will produce a darker coloration. Pearl Oysters are an adaptable species that fruits easily on a wide range of substrates and are good candidates for recycling wood and paper waste into edible mushrooms. 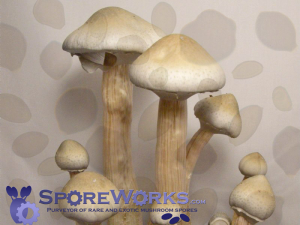 As with all oyster mushrooms, Pearl oysters need plenty of fresh air to develop normally. 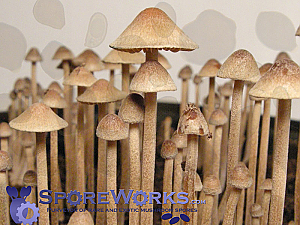 High carbon dioxide levels from mushroom metabolism will accumulate in sealed growing environments and can reduce cap size and elongate stems severely.Fruiting in open humidity chambers with frequent fresh air exchange will produce best possible yields. For additional cultivation information and grow guides visit our Links page. 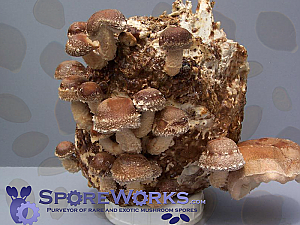 For an easy, ready to grow experience with Oyster Mushrooms, check out our Oyster Mushroom Grow Kit. 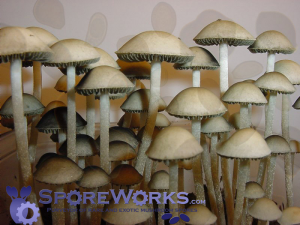 *Note: Culture supplied as living mycelium in a test tube slant. Culture can be stored under refrigeration for several months. Slants are best suited for long distance travel, international shipments, or long term culture storage. To ensure freshness of culture, slant requests are made to order, please allow 2-4 weeks for processing and shipment.